This Grace Based Parenting Training Kit includes six workbooks and saves you 33% off of the original price. Grace Based Parenting shows moms and dads how to love their kids the way God loves His: with grace! Parents will gain a realistic job description for raising spiritually strong children with calm hearts that are full of purpose and hope. Grace Based Parenting can be adapted to a variety of group sizes. We designed the Starter Pack to help you get started with your training for Grace Based Parenting. Additional Grace Based Parenting participant's workbooks are available. One of six children, Tim Kimmel learned early in life the importance of family. He married Darcy, his high school sweetheart, in 1972. They honeymooned at Dallas Theological Seminary where Tim earned his masters of theology, then moved to Phoenix to become a youth pastor until founding Family Matters in 1982. Tim graduated from Western Seminary in 1995 with a doctorate of ministry and is continually learning and applying his knowledge to help families. Tim and Darcy are the parents of four children, have a wonderful son-in-law, and have two grandchildren. They reside with their family in Scottsdale, Arizona. He is one of America's top advocates speaking for the family. He is the Executive Director of Family Matters and he conducts conferences across the country on the unique pressures that confront today's families. In addition to conducting Family Matters' conferences and keynote speaking, Tim and his wife, Darcy, are speakers for FamilyLife®'s Weekend To Remember getaway. 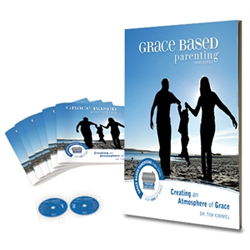 The Grace Based Parenting Training Kit Starter Pack includes The Grace Based Parenting Training Kit plus six additional Grace Based Parenting participant's workbooks.